“Keep it simple stupid” or put more gently, “Keep it short and simple.” KISS is an old yet relevant reminder that simplicity is king. This phrase rings true in design and in writing for the web. In a world of information overload, it is necessary to guide your customers to the right information, quickly. You may be surprised to learn how many online users DO NOT read. The bottom line is users are not reading what you are writing. In this post, we will discuss how to address these issues and make your customers coming back for more. These web writing strategies will improve your customer experience and increase the value of your website. Download Writing for the Web Worksheet Now! 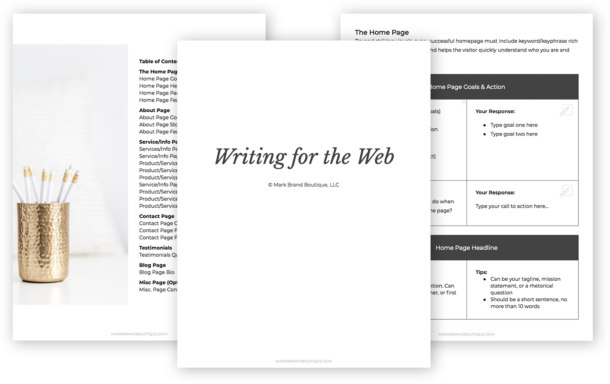 Get access to the "Writing for the Web" worksheet and all our other freebies available to our Mark Brand Boutique creative community members. Thanks for joining! Be sure to check your email to confirm your subscription to our mailing list. Please check your spam folders if you can't locate the confirmation email. Thanks! Use clear headings with high-level keywords to grab attention. Headings are the most scanned text on a page, so they are the most valuable. Front load each heading with recognizable keywords that clearly describe the section below. Don’t forget the KISS principle; long headings are difficult to read and lose effectiveness. Every webpage should have a short summary at the top of the page. A short summary must be informative and straightforward. A helpful tip for writing quality summaries is to start with the conclusion, highlighting the most newsworthy details first: who, what, where, when and why. Can you cut out the bottom half of your writing without altering the main message? Don’t overdo it in the body, keep it nice and concise. Readers love lists, so break up the body text with bulleted or numbered lists when appropriate. A general rule of thumb is web writing should be half of what you would write in a printed version. Because users read slower online, they are less likely to get through the same amount of text that is displayed in a print magazine or article. Use simple vocabulary and avoid industry jargon. You may be an expert in your field, but it is more likely that your customers are not. Using excessive jargon and long-winded words actually have a negative effect on your perceived value. Studies show that users perceive a lower intelligence of the author when the text is more complex. Pictures are worth a thousand words, so if users won’t read your text use visual media to help communicate your message. Media can include images, gifs, videos, and galleries but they must be used appropriately and strategically. Here is a question to test if the media hurts or helps your story. Only after 5 seconds of looking at the photo (or media) can your users guess the main topic of the writing? K.I.S.S. is an easy reminder to strive for simplicity but writing for the web can feel unnatural. Start implementing these six writing for the web strategies and keep practicing until it feels second nature, your users will thank you for it.